This article first appeared in symmetry breaking July 22. Editor’s note: The LHC experiments reported at the EPS meeting a tantalizing excess of Higgs-like events, short of claiming a discovery, but very intriguing nevertheless. See the Higgs search at the LHC section further below for more information on these results. The LHC experiments reported at the EPS meeting a tantalizing excess of Higgs-like events, short of claiming a discovery, but very intriguing nevertheless. See the Higgs search at the LHC section further below for more information on these results. Experiments at Fermi National Accelerator Laboratory and the European particle physics center, CERN, are zooming in on the final remaining mass region where the Higgs particle might be lurking. Over the next seven days, Fermilab’s CDF and DZero collaborations and CERN’s ATLAS and CMS collaborations will announce their latest Higgs search results at the High-Energy Physics conference of the European Physical Society. Scientists at Fermilab and CERN employ very similar methods to create the Higgs: accelerate particles to high energy using the world’s most powerful accelerators, the Tevatron (1 TeV beam energy) and the Large Hadron Collider (3.5 TeV), smash the particles together, and sift through the large number of new particles emerging from these collisions. But to find a Higgs particle among the many particles created, the teams of scientists are focusing on different signals (see below). If the Higgs particle exists and has the properties predicted by the simplest Higgs model, named after Scottish physicist Peter Higgs, then the colliders at Fermilab and CERN already must have produced Higgs particles. But finding the tell-tale sign of a Higgs boson among all other particle signatures is like searching for a drop of ink in an ocean. Only if the accelerators produce more and more collisions do scientists stand a chance of finding enough evidence for the Higgs particle. The Higgs mechanism, developed in the 1960s by several independent groups of theorists, explains why some fundamental particles have mass and others don’t. Its mathematical framework fits perfectly into one of the most successful theories in science: the Standard Model of elementary particles and forces. Experimenters sifting through data from one experiment after another have come up empty-handed; instead they have ruled out larger and larger swaths of potential Higgs territory. An analysis by the GFitter group of precision measurements and the direct and indirect constraints on the Higgs mass indicates that, in the simplest Higgs model, the Higgs particle should have a mass between approximately 115 and 137 billion electron volts (GeV)/c2, or about 100 times the mass of a proton. At Fermilab’s Tevatron, scientists attempt to produce Higgs particles by smashing together protons and antiprotons, composite particles that comprise elementary building blocks. When a proton and antiproton hit each other at high energy, scientists observe the collisions and interactions of these components, such as quarks, antiquarks and gluons. Those subatomic collisions transform energy into new particles that can be heavier than the protons themselves, as predicted by Einstein’s famous equation E=mc2. At the Tevatron, which makes protons and antiprotons collide, scientists focus on finding signs for the decay of the Higgs particle into a bottom quark and anti-bottom quark. Tevatron scientists have carried out detailed simulations of such collisions and found that the best chance for producing, say, a 120-GeV Higgs boson at the Tevatron are quark-antiquark collisions that create a high-energy W boson (see graphic). This W boson has a chance to spend its extra energy to generate a short-lived Higgs boson. The W boson and the Higgs boson would then decay into lighter particles that can be caught and identified by the CDF and DZero particle detectors, which surround the two proton-antiproton collision points of the Tevatron. According to the Standard Model, such a 120-GeV Higgs boson will decay 68 percent of the time into a bottom quark and anti-bottom quark. But other collision processes and particle decays also produce bottom and anti-bottom quarks. Identifying an excess of these particles due to the decay of the Higgs boson is the best chance for Tevatron scientists to discover or rule out a Standard Model Higgs. At the EPS conference, CDF and DZero will report (see press release) that, for the first time, the two collaborations have successfully applied well-established techniques used to search for the Higgs boson to observe extremely rare collisions that produce pairs of heavy bosons (WW or WZ) that decay into heavy quarks. This well-known process closely mimics the production of a W boson and a Higgs particle, with the Higgs decaying into a bottom quark and antiquark. At the LHC, located on the French-Swiss border, scientists smash protons into protons. Because the LHC operates at higher collision energies than the Tevatron, each collision produces on average many more particles than a collision at the Tevatron. In particular, the LHC floods its particle detectors with bottom and anti-bottom quarks created by many different types of subatomic processes. Hence it becomes more difficult than at the Tevatron to find this particular “ink in the ocean”—an excess of bottom and anti-bottom quarks in the LHC data due to the Higgs particle. At the EPS conference, the ATLAS scientists showed that they should have been able to exclude a Higgs boson with mass between 130 and 200 GeV/c2, but instead the collaboration saw an excess of events in the 130 to 155 GeV/c2 range, as reported by ATLAS physicist Jon Butterworth in his blog at the Guardian. 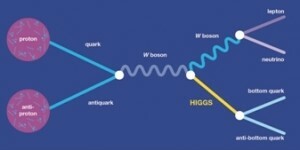 It could be a fluctuation, but it could also be the first hint of a Higgs signal. Geoff Brumfiel writes for Nature News that the CMS experiment also sees an excess in the 130 to 150 GeV/c2 range. (CMS physicist Tommaso Dorigo has posted the relevant CMS Higgs search plots in his blog.) Combined, the two LHC experiments should have enough data by the end of this summer to say whether this excess is real or not. The Tevatron experiments are getting close to being sensitive to a Higgs particle near 150 GeV as well. Here is the new DZero result: the dotted line, which indicates sensitivity, is approaching 1 near 150 GeV, but the solid line, which is the actual observation, is significantly below 1, yet it differs from the expectation only at the 1 to 1.5 sigma level. Bottom line: DZero scientists cannot exclude a Higgs boson in this range. And here is the new CDF result: Again, for a Higgs mass of about 150 GeV/c2, the sensitivity approaches 1, and the observed Higgs constraints agree well with the expectations. (Note that DZero shows 1-sensitivity and CDF shows sensitivity; that’s why the CDF curve is above 1.) On Wednesday, July 27, CDF and DZero will present their combined results for this mass range at the EPS conference. The sensitivity of the combined CDF and DZero results will be even closer to 1 at 150 GeV/c2. At the Large Hadron Collider, which smashes protons into protons, scientists focus on finding signs for the decay of the Higgs particle into two photons. For a light Higgs boson, LHC scientists focus on a very different Higgs production and decay process, complementary to the Higgs search at the Tevatron. Detailed simulations of high-energy proton-proton collisions have shown that the best chance to catch, say, a 120-GeV Standard Model Higgs particle at the LHC is to look for a Higgs boson emerging from the collision of two gluons, followed by its decay into two high-energy gamma rays (see second graphic). This is an extremely rare process since the Higgs boson doesn’t interact directly with the massless gluons and gamma rays. Instead, the Higgs production and decay occur through intermediate, massive quark-antiquark loops, which can temporarily appear in subatomic processes, in accordance with the laws of quantum mechanics. The intermediate loop, however, makes this process much rarer to occur. In particular, the decay of a 120-GeV Standard Model Higgs boson into two gamma rays happens only once out of 500 times. Hence LHC scientists will need to gather a sufficiently large number of proton-proton collisions to observe this process. Why do physicists think that the Higgs particle exists? The discovery in the 1980s of heavy, force-carrying particles, known as W and Z bosons, confirmed crucial predictions made by the Standard Model and the simplest Higgs model. Since then, further discoveries and precision measurements of particle interactions have confirmed the validity of the Standard Model many times. It now seems almost impossible to explain the wealth of particle data without the Higgs mechanism. But one crucial ingredient of this fabulous particle recipe—the Higgs boson itself—has remained at large. Does it exist? How heavy is it? Does it interact with quarks and other massive particles as expected? These questions will keep scientists busy for years to come. Want to learn more about what the Higgs particle is and how it gives mass to some particles? Watch this 3-minute video.